Balong 5000 officially unlocks the 5G era. This chipset supports a broad range of 5G products in addition to smartphones, including home broadband devices, vehicle-mounted devices, and 5G modules. It will provide consumers with a brand new 5G experience across multiple scenarios. As a 5G pioneer, Huawei began research and development in 5G as early as 2009, and is currently the industry’s only vendor that can provide end-to-end 5G systems. Huawei has more than 5,700 engineers dedicated to 5G R&D, including over 500 5G experts. In total, Huawei has established 11 joint innovation centers for 5G solutions worldwide. 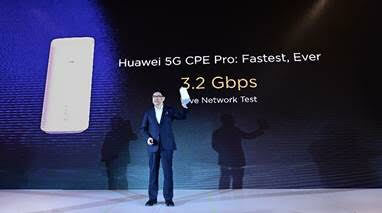 SINGAPORE – January 24, 2019 – Huawei officially launched its 5G multi-mode chipset Balong 5000 today – along with the first commercial 5G device powered by it, the Huawei 5G CPE Pro. Together, these two new products provide the world’s fastest wireless connections for your smartphone, your home, the office, and on the go.